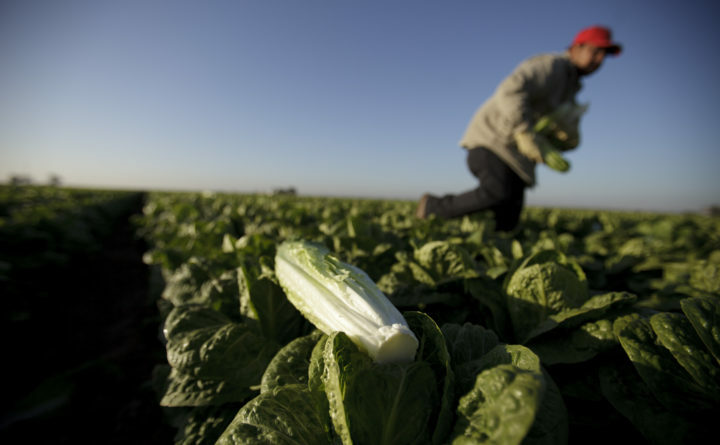 In this Jan. 31, 2012 photo, a farm worker carries heads of romaine lettuce in the lettuce fields near Holtville, Calif.
Fresh food Manufacturing Co., based in Freedom, Pennsylvania, is recalling the prepackaged products after learning last week from their romaine lettuce supplier that the vegetables may have been contaminated with Escherichia coli, the U.S. Department of Agriculture said Saturday. Officials said the recalled products have not been tied to any E. coli-related illnesses. The Food and Drug Administration said Friday that the outbreak, which began in mid-March, may have been caused by bagged and pre-chopped romaine lettuce grown in the Yuma, Arizona, region, near the border to Southern California, and distributed to retailers across the country. The agency has not identified specific farms or companies that grew, supplied and distributed the contaminated vegetables. Health officials in Montana and Arizona also said they each have three confirmed cases of E. coli infections, but federal officials have not linked those cases to romaine lettuce from Arizona. The CDC has not responded to an inquiry about the two states. The Washington Post’s Roberto A. Ferdman and Abha Bhattarai contributed to this article.